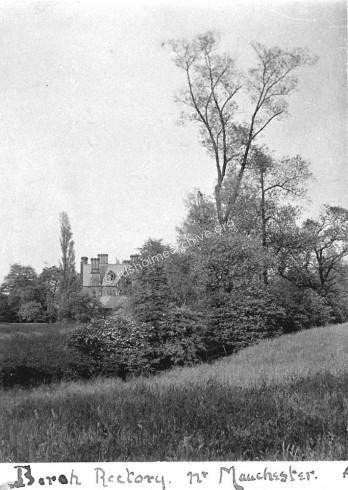 The view below is from a card marked 1906, but the photo may be earlier, the camera must be somewhere near the Hollings College area, (Cromwell Grange perhaps?) as houses would otherwise be in the view. The building on the right is St James Rectory. 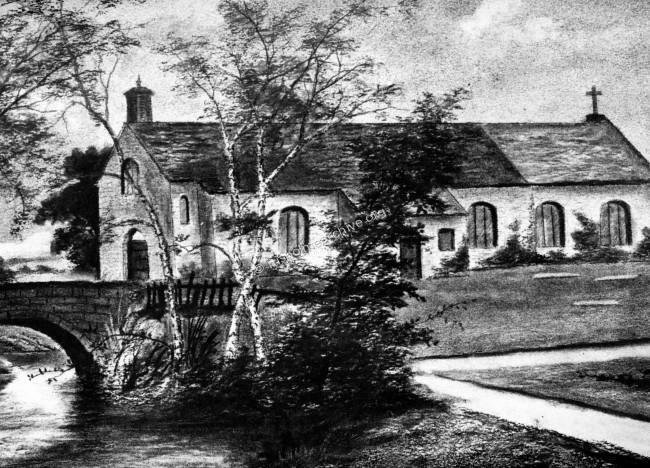 The inhabitants of Rusholme were, previous to the seventeenth century, few in number, consisting of less than forty families, and the old chapel, doubtless built of wood, close by Birch Hall, was originally erected in Queen Elizabeth's reign as a domestic chapel by that family, for the use of themselves and their dependents and neighbours. The following extract is from a History of Manchester by F A Bruton, published in 1924. 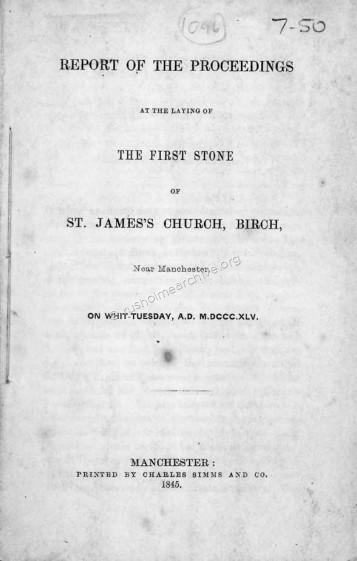 'The church known to-day as St. James's, Birch, occupies the site of one of the little local chapels mentioned in an earlier chapter; this one having been built in the reign of Elizabeth, doubtless originally for the use of the family at Birch Hall, whose sympathies seem to have been with religious freedom. 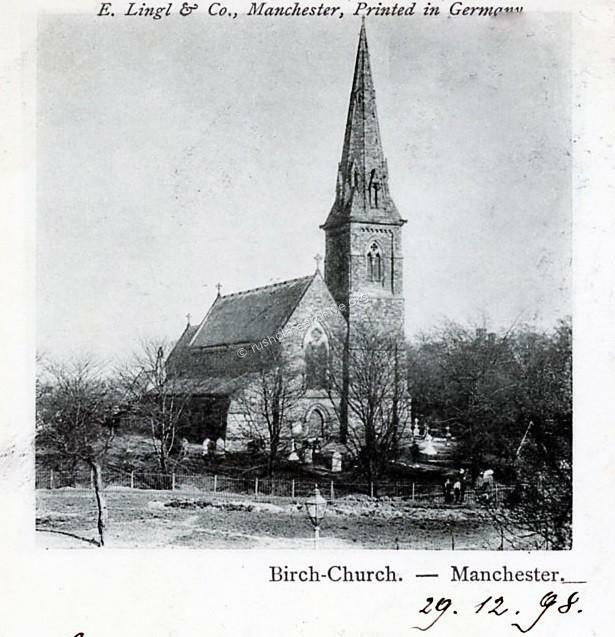 In 1646 a certain minister, having tried for some time to inculcate " Independent " principles at Gorton Chapel, moved to Birch, and there set up 'congregational-ism'. There were objections from the more 'orthodox' church and eventually the minister resigned. However, Birch Chapel, continued to be especially suspect. People met to worship at Birch Hall by stealth. 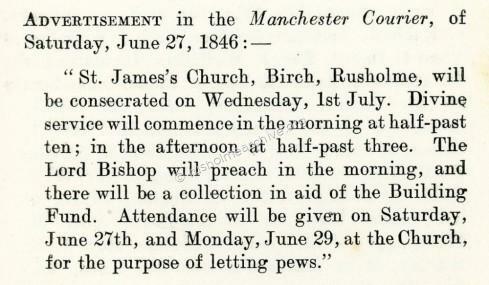 There are extant lists of inhabitants of Rusholme who were reported by specially-appointed watchers for not attending the parish church, (they having been seen to enter Birch Chapel), and these were fined accordingly. In 1673 the King permitted non-conforming ministers to obtain licences to preach in private houses. Even then the minister of Birch Chapel was interfered with, and eventually, in 1697, with the assistance of friends, he erected the little chapel at Platt, and became its first minister, the ground being given by the Worsleys of Platt, another family with Nonconformist leanings. 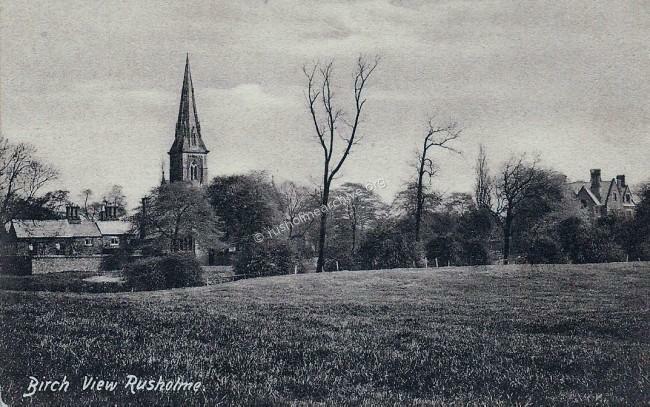 As the middle of the 19th century approached it was very obvious that the small chapel at could not hold the increasing population of Rusholme. 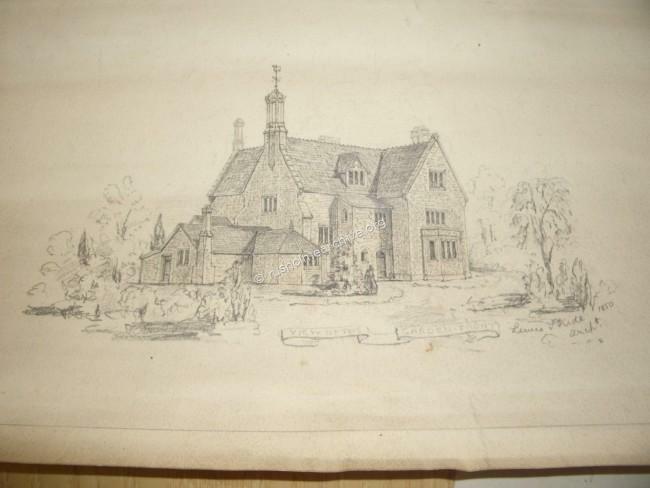 The pencil sketch below is a presumed view of the chapel which was was demolished circa 1846 at the same time the new church was being built. Sir John William Hamilton Anson was the eldest son Sir George Hamilton Anson. 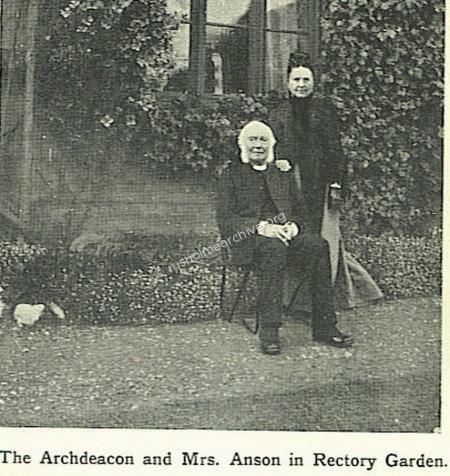 Sir George had married the daughter of John Dickenson and through this marriage inherited the Birch Estate. When Sir George died his eldest son John inherited Birch & other estates & the title, but in particular the gift of the incumbency at Birch Chapel. 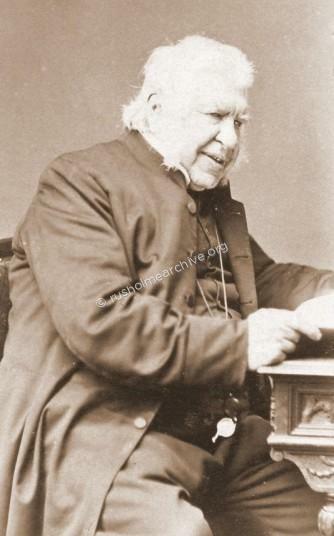 Sir Johns younger brother, George Henry Greville Anson has been ordained a deacon in 1843, becoming at curate at Leeds where the incumbent was a Dr. Hook. 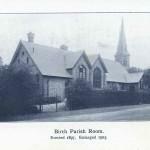 Whilst still working in Leeds he was planning to become the Rector at the proposed new church at Birch. The opening page of the Report is reproduced below and it clearly makes apparent the generosity of the Anson family in providing land, money & ultimately the incumbent! 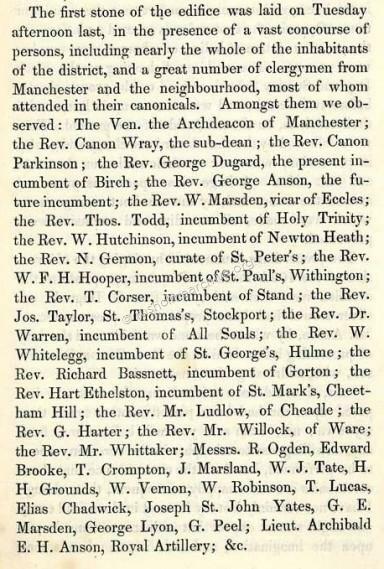 Another page of the Report listing some of the Guests. 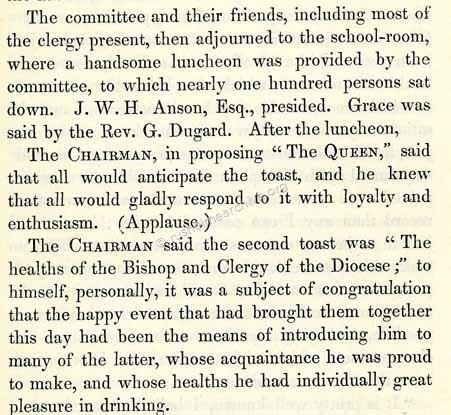 A handsome luncheon was something probably not very new to the Rev. Anson when you read below that he had been educated at Eton & Oxford! If you would like to read the 23 pages of the proceedings I have scanned the entire document. It can be downloaded and read provided you have Adobe installed. 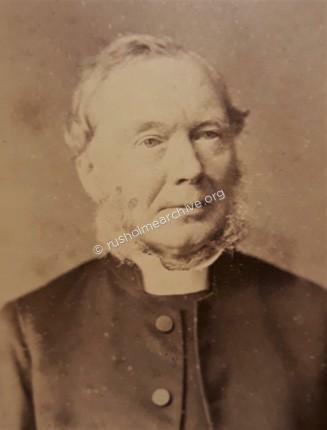 The Rector, George Henry Greville Anson was incumbent at St James Birch from 1846 until his death in 1898. He was educated at Eton, Christ's Hospital and Exeter College, Oxford. The Archdeacon was at Oxford in exciting times, and took a great interest in the Tractarian movement, headed by Newman, Keble and Pusey. It may have been that at Oxford he had met John Ruskin. In 1864 Rev. 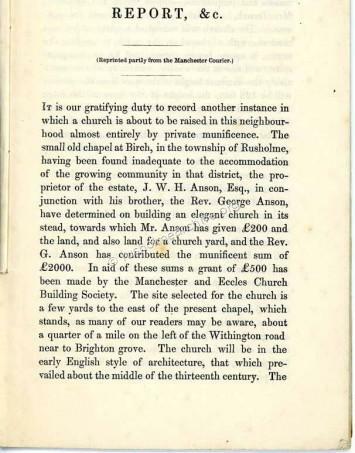 Anson invited John Ruskin to Rusholme where he gave a lecture at the newly built Rusholme Institute, (Dickenson Rd) called, 'On Kings Treasuries'. He was ordained as curate of St Saviours, Leeds under Dr. Hook, and he eventually married Augusta Agnes, daughter of Dr. Hook. Dr Hook was a well known Victorian figure in the Anglican church and now merits four pages in the Dictionary of National Biography. 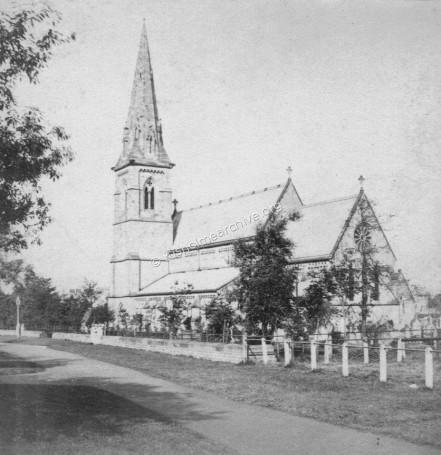 He had shown considerable sympathy to the Tractarian movement and this may have influenced Anson in the choice of Derrick, the architect for the new church at Birch. Dr Hook became a regular visitor to Birch-in-Rusholme and was known to have been a speaker at the Birch Literary Society. 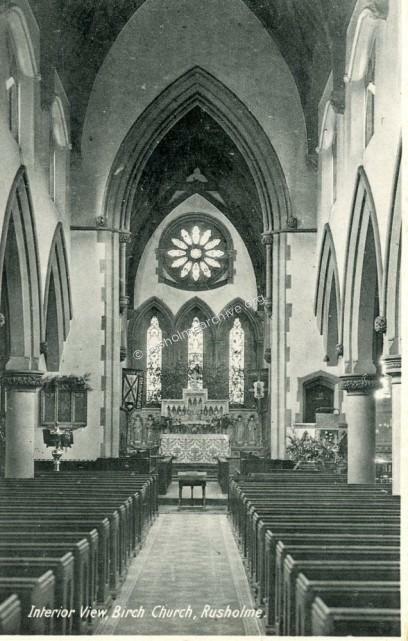 It was against this background that Rev Anson had commissioned the architect, John Macduff Derrick to design the new church, St James. Anson had seen his design for a work at Oxford, (The Martyrs Memorial, but not commissioned) and when he became the curate at St Saviours, Leeds the newly built church there was also by Derrick. John Derrick is said to have trained under Sir John Soane and was a friend of Pugin. 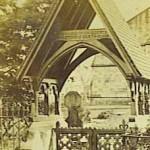 The total cost of the church was £4,300. Photograph above from the mid 1860's by Helmut Petschler. The Rectory at St James. Construction of the Rectory did not start until 1854 when a London architect, Lewis Stride was commissioned to create a suitable home for the younger son of a Baronet. Before the large Rectory was built on land adjoining the Church the Rector and his wife lived in a rather more modest home on Moon Grove, off of Dickenson Road. 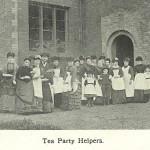 Images below are from M315 collection, held by Manchester Archives. 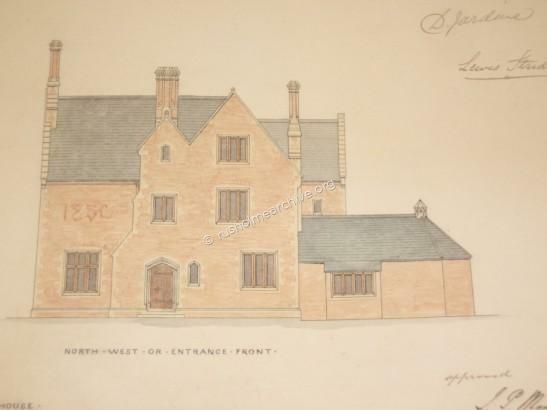 I should like to express my appreciation to staff at the Manchester Library Archives and The Greater Manchester County Archives in helping me find these illustrations and giving permission to display them on this website. The whole of the stone to be used to be of the very respective kind and worked according to the laws of true masonry! 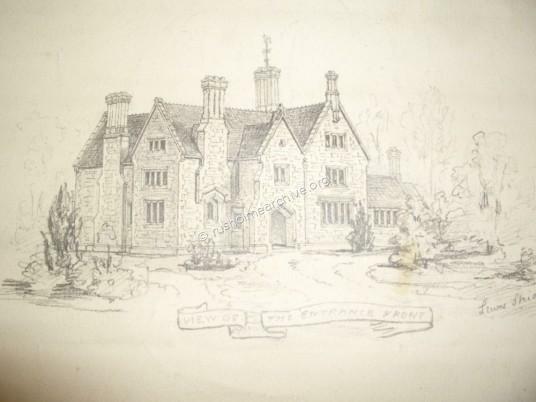 In 1929 the the Rectory was sold and can still be seen in the adjoining grounds of Manchester Grammar where it is now used as part of the school teaching premises. 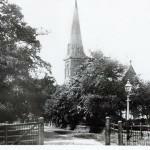 A house was was purchased on Norman Rd for use as the Rectory until St James Church was closed in 1980. 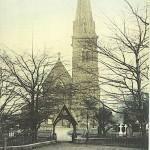 The many happy events of marriage and baptisms that occurred here are testimony to the standing of this Anglican church in the past century. 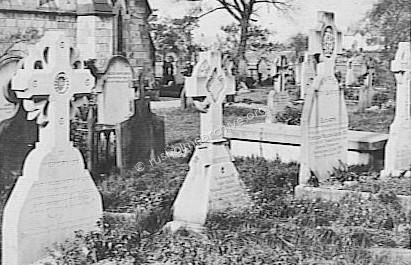 Sadly many of the burials that were recorded so visibly on the many gravestones around the church are now only to be seen on photographs. As a consequence of the Church coming into private ownership all of the gravestones, (except some that had close living relatives), were bulldozed into a big mound at the rear of the church. 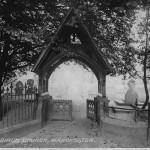 Many of the names of old Rusholme families buried here had their visible history cleared away so that it seemed to be almost vandalism. The names are now only records on Church documents. A few of the significant gravestones were removed to the easterly boundary, Royle, Donner, Anson, Wright & Worsley amongst others, but these are neglected, vandalized and overgrown. 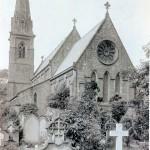 More recently,,,,, (2012), the graveyard had been tidied and the stones referred to above can now be seen. 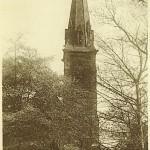 Always considered a pretty corner of Rusholme here are some views of St James.